It looks like STEP has not been a total failure, with 500 tickets (less than 1% of the 58,000 sold) being recycled through the program. And not every theme camp is needing tickets, so there is still a chance that some of that 10,000 ticket allotment could go towards STEP. Unfortunately, BMorg are not going to listen to the overwhelming desire of the community to link tickets to identity, as many other festivals do to prevent the scalping problem. No official word on “why” they would do that, just like clubs don’t explain why they make you wait in line. The idea that this is “against gifting” doesn’t wash with me, if would be simple to choose which identity you want to associate with each of your tickets. So if the tickets didn’t go to Burners, they didn’t go to family and friends of Burners, and they didn’t go to scalpers – who did they all go to? The mystery continues. As for her other major preoccupation of the year – dealing with the fallout of a new ticketing system that left many veteran burners without tickets – Goodell said they’ve been sorting out that situation as well: distributing the final 10,000 tickets, which were going to be sold generally, through established theme camps. Some sources have told us that demand from the theme camps had actually been less than anticipated, but Goodell said they still need to get tickets to various performers, volunteers, and art car crews. “We have a lot of people to take care of,” she said. She also said that she’s been pleasantly surprised by the number of tickets that are being sold through the STEP ticket resale system that the Borg hurriedly established to redistribute tickets, with more than 500 being offered so far. “It’s a trickle, but it’s not stopping,” she said. Yet there could still be a bit of grumbling to come over the tickets. The final decision for the Borg to make was whether to require ticket holders to register by name to control scalping – a decision it would need to make before tickets are mailed out in June – and sources say the Borg has decided not to do so. With demand for tickets far exceeding anyone’s expectations this year, tickets selling out for the first time last year, and with a new system that many said could easily be gamed by scalpers, the unknown factor is how many were snapped up by scalpers who are charging exorbitant prices. The Borg has maintained that they think that number is fairly small, but we’ll see this summer. Thanks to Scribe at SFBG for bringing us this info. He’ll be doing a reading and leading a discussion on the state of Burning Man from 6-7pm on April 25 at the Bay Guardian office, 135 Mississippi St., SF. So the problem still is, there are so many burners out ther not able to get tickets. They are not eligible for step….so what do those folks do? seems like, your name is on the ticket, when they come into your RV to see if anyone is stashed away somewhere, you show your IDs. Doesn’t seem too much of a logistical nightmare to me – I guess it depends on how difficult you view printing a ticket to be in 2012. I’ve yet to understand how putting names on tickets will help this situation. 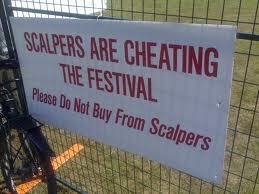 Scalping seems more of a nuisance than a real problem. Danger Ranger Tweeted how tickets were going for half of face value in Gerlach on Tuesday last year. So the lottery was a huge over reaction to a minor problem. Adding names on tickets will be a logistical nightmare in terms of burners legitimately transferring or gifting their tickets and also at the gate. What do you do when your friend buys you a ticket and misspells your name? What do you do when you can’t go at the last minute and you want to give your ticket to someone else? This will be my 8th year and from previous experience I’m already dreading what the line will be to get the tickets I bought through STEP and then worried that the second ticket somehow won’t find my friend who is coming separately. It seems more reasonable to sell tickets first through registered Theme Camps/Art Projects/Art cars, then to burners who have attended for multiple years. This way you are directing tickets to people with a vested interest in the community, then release whatever quantity is left to the general public.